Horseweed, also known as Butterweed or Coltstail, is a member of the daisy family (Asteraceae) and native in North America. In earlier days, the plant was attributed to the Erigeron genus. It is a annual flower with straight stems that may reach 1 meter (3ft) and roots of the same length. The stem branches out at the florescence. The blossoms are inconspicuously placed in the panicle at the top; blooming period is from July through October. It grows on slopes, railway dams, forest clearances and on fallow land. Active ingredients include tannic acids and essential oils, Flavones and Cholines which have anti-inflammatory properties. 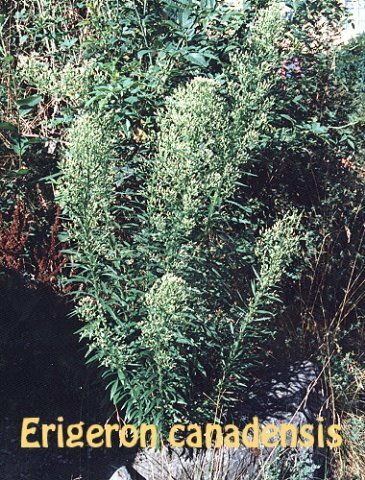 In the United States, Horseweed is popular for treatment of varicose veins and diarrhea. It is also used to treat diarrhea. Take 3-6 capsules daily, with plenty of water.